This posting reflects edits and improved photography from the original version posted in September 2010. Thank you to my loyal reader(s) for trying these at home and helping us achieve perfection. We threw the first version together on a Sunday afternoon to bring to a chili cook-off party. 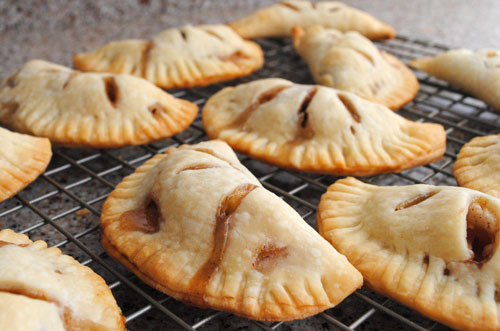 These can be made in any shape desired, noting that larger turnovers will require slightly more time for baking. Mix flour, 1 tsp. sugar, and salt in a large bowl. Add 4 Tbsp. of the butter. Blend in a food processor or with a pastry cutter until dough resembles coarse cornmeal. Cut-up remaining butter into small pieces and add to dough mixture. Continue mixing until the largest pieces look like large peas. Add water one tablespoon at a time until dough just holds together. Toss with hands until dough rolls into a ball. Flatten into two 4-inch-thick discs between wax paper and refrigerate for at least 1 hour. While dough refrigerators, prepare apples: peel, slice in half, core, and cut into small dice, should yield 1-1/2 cups. In a medium mixing bowl, combine remaining 1/4 cup sugar, cinnamon, and corn starch. Add apples and raisins to sugar mixture, stir until fruit is coated with sugar. Add applesauce and vanilla and stir. Preheat the oven to 400 degrees-F. Remove dough from refrigerator, let soften so the dough malleable but still cold, approximately 5 minutes. On a piece of parchment or wax paper, roll each dough disc into large circles, about 1/8 inch thick. Cut into 4-inch diameter circles with a biscuit cutter, yielding approximately 6 circles from each rolled disc of dough. Place dough circles on a parchment-lined baking sheet. Lightly beat the egg white and stir in milk. Set aside. Fill each circle with approximately 1 Tbsp. of the filling leaving 1/2-inch edge around the square. Use a pastry brush to add egg wash to the dough edge. Fold in half to form a half circle turnover. Press edges together with the tines of a fork. Brush top of turnover with egg wash. Cut slits in the top of the turnover to allow steam to escape during baking. Bake in the center of oven until crust is lightly browned, approximately 15 minutes. Remove turnovers from oven and slide onto cooling rack. Let cool at least 15 minutes before serving.